WEFTEC® 2013 volunteers help construct a rain garden at John C. Haines Elementary School in Chicago. Photo courtesy of Haley Falconer, Haley Falconer, vice chair of the Water Environment Federation (WEF; Alexandria, Va.) Students and Young Professionals Committee. The WEFTEC® 2013 annual service project made a big splash this year. 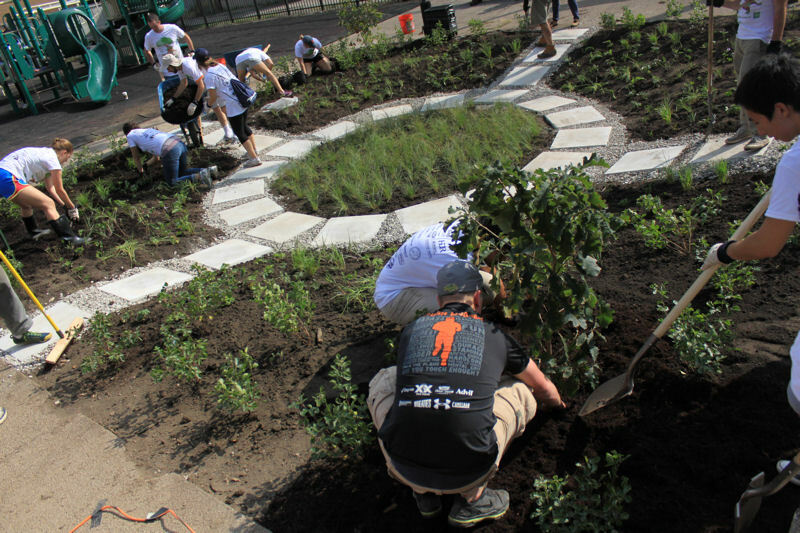 Approximately 110 volunteers came out to the Reading, Writing, and Rain Gardens event to help replace pavement with green space at the John C. Haines Elementary School in Chicago. The Water Environment Federation’s (WEF’s; Alexandria, Va.) Students and Young Professionals Committee (SYPC) organized this 6th annual service project to help reduce urban stormwater. On Oct. 5, volunteers helped remove a concrete layer subsurface; lay topsoil; plant 13 different types of grasses, flowering plants, shrubs, and trees; lay 28 stone pavers to form a walking path through the garden; pick up trash in the neighborhood; and add screen fencing to block litter from entering the playground. The school now has a 95 m2 (1,024 ft2) rain garden and an additional 93 m2 (1,000 ft2) of planted green space. Approximately 110 volunteers helped remove a concrete layer subsurface; lay topsoil; place 13 different types of plants; lay stone pavers; pick up neighborhood trash; and add fencing for the project. Photo courtesy of Falconer. “It was amazing to see the volunteers work as a team to accomplish a complex construction project,” said Timothy Moran, SYPC community service project chair. “This event is important in demonstrating our profession’s commitment to the communities we serve. The rain garden will be a valuable tool for the school to teach its students to be stewards of the environment,” he added. 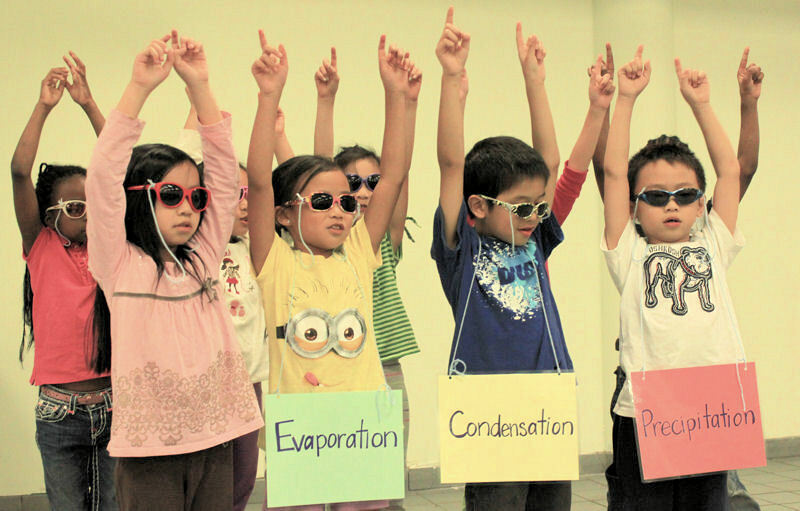 WEF volunteers also organized a Water Palooza educational event at the school where students learned about various water-related topics including the water cycle. Photo courtesy of Michael Quamme, SYPC member. This year’s project had a ripple effect that reached inside the school. On Oct. 4, a total of 10 volunteers, seven from the SYPC, helped host the Water Palooza educational event at the school. A total of 11 volunteers representing eight organizations manned booths at the event. Nearly 700 elementary school students visited booths and participated in interactive games and activities educating about nonpoint-source pollution, pollution’s effect on animals, rain gardens, what can and cannot be flushed down the toilet, current sustainable technologies, and what it is like gathering water in developing countries, said Michael Quamme, an SYPC member who helped coordinate Water Palooza. WEF hosted a WATER’S WORTH IT booth educating about careers in the water industry, the World Water Monitoring Challenge (WWMC), a toilet toss game, and an interactive station to educate about what can and cannot be flushed. Several WWMC test kits were donated to the school, Quamme said. 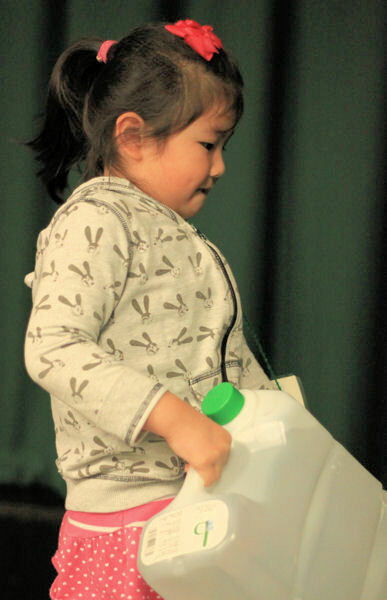 During the Water Palooza, students were able to carry water jugs to simulate gathering water in developing countries. Photo courtesy of Falconer. In addition, students at the event were able to see a live Bull snake, tour a zero-emission electric car, and carry water jugs to simulate gathering water in developing countries. Other activities included a coloring station, an assembly for seventh and eighth graders providing an in-depth look at rain gardens and how they work, and demonstrations on sources and prevention methods of nonpoint-source pollution, the water cycle, and how soil and plants help prevent pollution, Quamme said. “Through these lessons, we believe that we were able to give the students an appreciation and respect for the rain garden that would be constructed at their school the following day as well as water in general,” Quamme said. “Reading, Writing, and Rain Gardens” WEFTEC 2013 service project volunteers helped build a rain garden and host an educational Water Palooza for students. Photos courtesy of Falconer and Quamme.